The illustrated booklet has an easy to use lateral key. 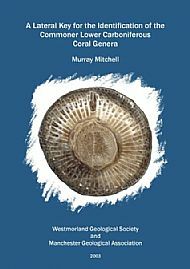 It shows you how to recognise the various structural elements in an ordered way to allow fossil corals to be identified to generic level. It can be used for indoor identification or as a field guide. If you would like to purchase a copy, please contact the secretary, whose details can be found via the JOIN US link on the left side of the screen.